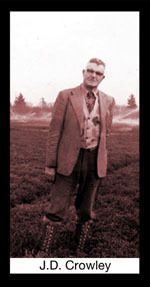 The Pacific Coast Cranberry Research Foundation was formed to purchase the Cranberry Research Station owned and operated by Washington State University. When WSU decided to close the Station in 1992, cranberry growers formed the Foundation and purchased the Station and 40 acres of farmland. WSU continues to support the personnel, while growers join together in farming the bogs. 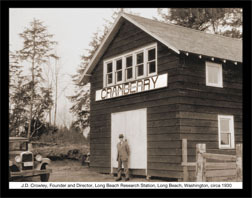 Cranberry farming in the SW corner of Washington State has a more than 100-year history. A Massachusetts visitor observed the native berries growing in the marshes and was impressed with the area’s resemblance to Cape Cod. Convinced that the peat soil could be successfully adapted to the cultivation of commercial cranberries, a partnership of 4 entrepreneurs purchased more than 1600 acres of Peninsula land between 1872 and 1877 for as little as $1 an acre. The industry built between 1877 and the turn of the century, when it hit a period of stagnation. Cranberries weren’t sought after by Americans except during the Thanksgiving and Christmas holidays and the established bogs on the East Coast already filled that market. To make matters worse, East Coast vines brought with them non-native pests, marketing West Coast berries was expensive due to its geographic isolation, start-up costs for the bogs was high, and taxes were frequently higher than profits. 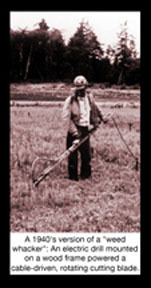 A boon was experienced in the 1910s when syndicates purchased and sold several thousand acres of marshland. This increase in the number of farmers and bogs, combined with the still existing problems of the past ten years left the growers that survived in an anguished state. Help arrived in the early 1920s in the form of J.D. Crowley. Conducting tests over a 30-year period at the Cranberry Research Station, Crowley was able to make recommendations to solve a number of pest, frost and other local problems. Growers did not immediately adopt these recommendations. Combined with the Great Depression of the 1920s and 1930s, the industry whittled itself down to a few highly committed farmers. The next 40 years brought many changes to cultivation methods, increasing product yields and quality. A significant change during the 1940’s was the switch most growers made from dry to wet harvesting of the berries. There are currently about 235 growers on the West Coast from British Columbia to Oregon. The industry is strong and stable as it enters the new millennium, with year-round demand for juices, canned goods and a variety of cranberry products. 99% of local growers are part of an Ocean Spray cooperative. Many of the original “dollar an acre” bogs are still viable today. Not surprisingly, the cost of growing has increased substantially with raw land suitable for cranberries now costing over $5,000 an acre. Growers are challenged by falling crop prices and environmental regulations. In spite of high costs, Cranberry farming on the Pacific Coast has a bright future. The creative, aggressive marketing by Ocean Spray Cranberries, Inc. has brought the demand for cranberries to an all time high. Employees for the WSU Long Beach Research and Extension Unit include Kim Patten, Ph. D., associate horticulturist and station manager, who serves as an extension specialist and agricultural researcher. There is also a research technician, and a three-quarter time secretary. Temporary personnel have included visiting scientists, post-doctoral researchers, graduate students, college interns, and summer students.